This is a reprint of a sheet that was Iliad Designs first offering. That sheet sold out rather quickly and so this reissue was done. This time the markings were moved around a little and a fifth option was added. All aircraft are in the standard green/earth upper surface colors with most of them having the white/black undersurface. Note also that most of these options have the wooden prop, and all of them have the straight radio mast. First up is a 73 squadron plane from 1938. It has the 'kidney' exhaust and an aluminum colored underside. It wears the B pattern. Next, with the white in the roundel painted black, is an 85 squadron plane from 1938/39. It has the A pattern camouflage. A 17 squadron plane is next from 1938 and is in the A pattern as well. 'Munich Crisis' roundels are on this 56 squadron plane from 1939. Note that this plane has the later metal wings and deHavilland prop. 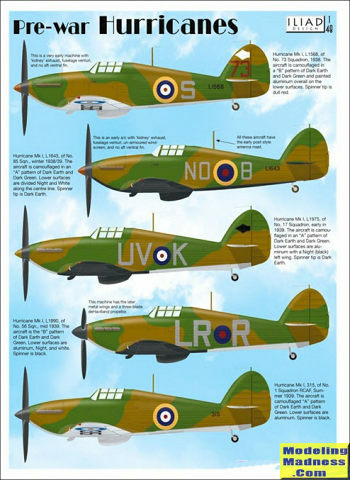 Finally, a Canadian plane of 1 squadron, RCAF in 1939. This plane has the aluminum underside. 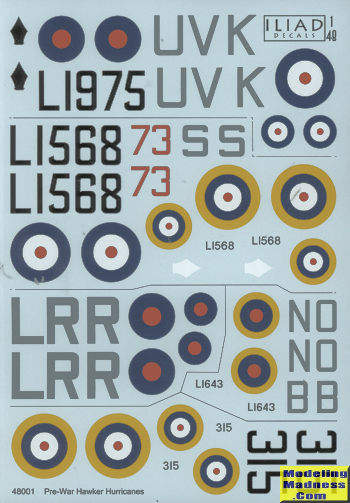 Decals are nicely printed (I've darkened the sheet a bit to better show the white) and the instructions provide camouflage patterns for all sides as well as the top and bottom of each option. Well worth getting for your next project, especially if you missed it first time around.